The picture-perfect parish church of Heiligenblut in Carinthia. 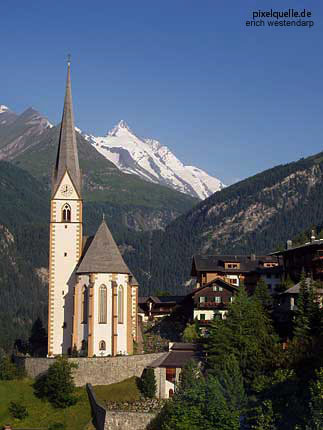 Its characteristic tower and the dramatic Tauern mountains in the background made this church famous. Heiligenblut is one of the two access routes to the "Großglockner Hochalpenstraße" in the National Park Hohe Tauern. This road is one of the highest mountain streets in the World and leads to Austria's highest mountain and its glacier. The alternative route starts in the South of Salzburg province.